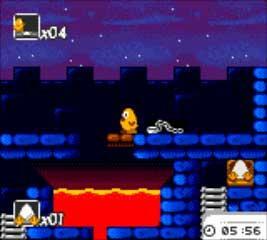 Toki Tori is probably a game you’ve heard of or played on one of several devices, but never payed much attention to when it first hatched back on the Game Boy Color over a decade ago due to how low it flew under the radar. 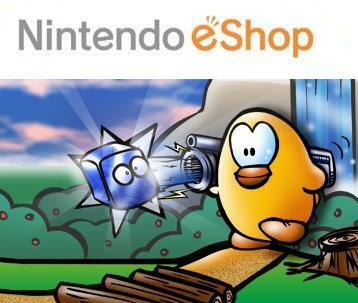 Being part platformer, part puzzler, and all heart deemed this title a “hidden gem” by many, and thankfully, Toki Tori is back in it’s debut form on the 3DS’ Virtual Console. Has ten years made this bird grow grey feathers? Let’s find out. The whole concept of Toki Tori is just as adorable as the main protagonist that bares the name. Players take control of a young and brave chick who sets out on a journey to save his unborn family across four colorful worlds. 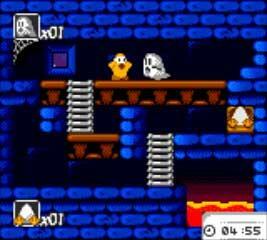 Each stage is made out of platforms, ladders, and environmental obstacles, and players must get their bird to waddle about through each area safely while collecting eggs. Once all eggs are obtained, it’s on to the next area. Yes, it’s a simple game, and the controls also follow suit by being very accessible. 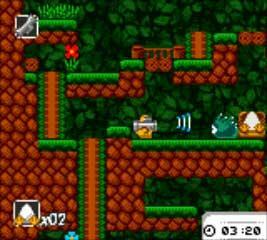 The player can hit A to have Toki Tori hop up to higher ground, or dash out of the way from a foe by double tapping the D-Pad. One may think those basic actions would make this journey hard for a young hen, but luckily, as the game progresses, several tools come into play to assist in getting those hard to reach eggs. Early on, players will be able to form small bridges by laying down logs or teleport past walls by using the appropriately named telewarp. As the game advances, enemies begin to show up more often and Toki Tori gets to utilize a bit of an arsenal with a Freeze Ray in tow, and the Bubble Suit also comes into play to make life a bit easier by allowing for quick travel during more chaotic moments. There are a good number of abilities Toki Tori can use as a whole, and each work well to keep this adventure fresh until the last of your kin is saved. That being said, the level design itself as well as the limited uses of items is what really gives the game it’s “peck”, so to speak, due to the strategy that is needed to succeed. 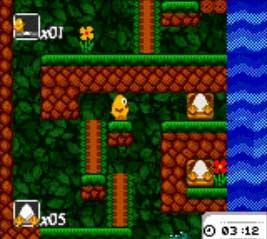 You see, many stages are built around the abilities of Toki Tori, and for most, the player will not be able to just speed-run through. Every area you up to or platform your drop off must be planned out ahead of time in order to properly utilize your chick’s abilities. For instance, if you have one telewarp and happen to misuse it, you will need to restart the level and try again. There are no checkpoints in-between eggs, there is no undo button. As a participant in this puzzling little universe, the player must strategize in order to finish a stage and gather the yolky loot effectively, which is where the brilliance of Toki Tori beams through. As far as replay value goes, there isn’t a whole lot left to do after the game is beaten, but again, considering this is a Game Boy Color port, most will not leave unsatisfied as there is still hours of mind bending gameplay to be found within the game overall. The Game Boy Color was coming to a close when Capcom published this title, and it does show it’s age as almost all older games do. Looking back though, Toki Tori was and still is one of the best looking games on the handheld, as it is filled with crisp character designs and vibrant, colorful worlds. Animations are just as chipper, as watching Toki Tori dance out of happiness and scuttle about each stage keeps the experience light hearted and charming until the end, making the experience feel quite fulfilling as everything ties together as a whole package. Audio wise, there are a lot of decent little songs to keep this adventure a joy for those eardrums. I want to say that Toki Tori’s soundtrack reminds me a bit of classics like Donkey Kong Country, but that comparison may rob this title of it’s musical originality as these clever beats stand on their own quite well and don’t sound as if they’ve aged a day. With Toki Tori 2 right around the corner for the Wii U, there is no better time than now to get acquainted with the little yellow hero that started it all. Yes folks, this puzzle/platformer nearly perfected the art, and gives plenty of reason to splurge that eShop cash. Toki Tori may not be the most challenging title or have all of the extra features we see in today’s releases, but it is sure to make you use that egg in your own head while still delivering plenty of charms and smiles along the way.